Conker drives in the Dino Domain hub. Dino Domain is the first world of Diddy Kong Racing and Diddy Kong Racing DS and an area of Timber's Island. Racers are required to have at least one Golden Balloon to enter. Dino Domain is set in a dry, prehistoric area with dinosaurs and pterodactyls. Most of the courses are in a canyon landscape, which features small lakes and some plant life, specifically grass and pine trees. One of the stages is set in an entirely volcanic region, along with its Challenge Level. Tricky the Triceratops is the boss of Dino Domain. The world's hub is located to the right of Wizpig's rock-carved head on Timber Island. To enter Dino Domain, the racer drives up a small bridge leading into a tunnel carved in a hill. A large door to the hub is located at the end. A rainbow is positioned just outside the tunnel, likely resulting from the waterfalls on each side. The Challenge Door is located on the right side, with a small pond just outside it. Like its subsequent worlds, Dino Domain has a Trophy Race that the player can enter after they win against Tricky again. Also like the other worlds, T.T. walks around the center of Dino Domain's hub, and the player can bump into him to review their game progress. × 6 (Silver Coin/Balloon Pop Challenge) Car, Hovercraft, Plane Ancient Lake is set in a canyon. It has a rocky, gray road with grass patches and trees on the side. The second half of the level features a river and a wandering dinosaur. It occasionally cross the road and may trample over racers. Ancient Lake has the world's Wish Key, which is needed to unlock the world's Challenge Level, Fire Mountain. × 7 (Silver Coin/Balloon Pop Challenge) Car, Hovercraft, Plane Fossil Canyon is a sandy, dusty, and rugged area. Its race takes place during sunset. 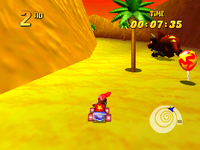 Another dinosaur appears in the stage, but it remains in the background and does not interfere with the race. 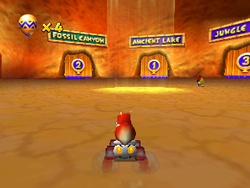 Racers drive through a cave at one point, which can either be entered from the usual curved path or from a Zipper to shortcut across a lake just outside of the cave. × 8 (Silver Coin/Balloon Pop Challenge) Car, Hovercraft, Plane Jungle Falls is set in another rocky, rugged area. The course starts out relatively bumpy from large dinosaur footprints in the road. The path leads to a ditch, with two small waterfalls forming a lake into it. Racers can drive across the ditch from a bridge and some empty ruins just ahead. Racers encounter a large dinosaur skull shortly after they exit the ruins. They can use a Zipper below it to quickly reach the finish line. Jungle Falls is considered the shortest race track of the game. × 10 (Silver Coin/Balloon Pop Challenge) Hovercraft, Plane Hot-Top Volcano takes place inside a volcanic cavern. It is the first course where racers use Planes and cannot use Cars. They have to pilot through a cave and even past a large dinosaur from the first two courses. Hot Top Volcano is filled with lava, but it does not effect the racers. × 11 + every track completed Car The player races against the world boss Tricky on a racetrack that spirals up a mountain and ends on its summit. The race features rolling boulders, and Tricky may knock over stone pillars that block part of the path. The racer must avoid these pillars or being trampled over by Tricky, both of which slow them down. Tricky provides the racer with part of the Wizpig Amulet after he loses at the rematch. Fire Mountain (N64 only) Ancient Lake's Wish Key Plane The player can access this Challenge Level after they obtain the Wish Key in Ancient Lake. It takes place in a volcanic area like Hot Top Volcano. There are four racers, each of whom compete to hatch three eggs first. Racers must attempt to guard their nest, because their opponents attempt to steal an Egg before it hatches. The player receives part of the T.T. Amulet if they win. Fire Mountain was replaced with a short Wish Race against T.T. in the DS remake. The early entrance to Dino Domain, which was once lengthier. Diddy drives in the Dino Domain hub. This page was last edited on November 12, 2018, at 10:53.